Featuring a spacious 20 litre capacity this red 700 Watt microwave from Akai has 5 power levels. It has a 60 minute digital timer and a stylish circular digital display. Other advantages to this microwave include a pull door handle, a cooking end signal and a defrost setting. The microwave also comes complete with a 245 mm glass turntable. 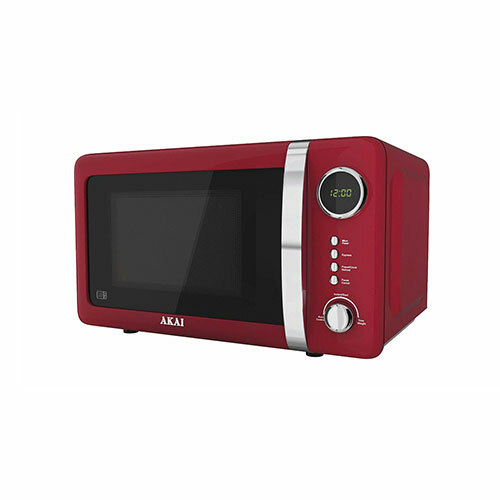 This deep red microwave from Akai combines great style with perfect functionality, giving a retro yet contemporary feel. Heat or cook your food precisely and in style without any effort. 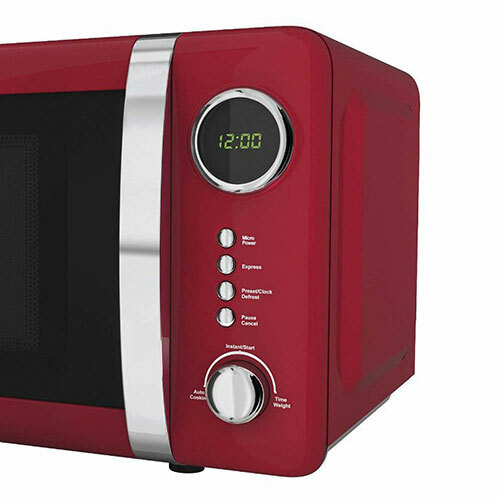 Ideal for use in a small family home or for a couple, this red microwave it guaranteed to brighten up any kitchen area. Every home needs a microwave and one from the Akai range can really liven up your cooking area and add a touch of style with it soft rounded design. Another great thing about the red microwave from Akai is it can be colour-matched with a range of other red kitchen accessories, even from other brand including Swan and Russell Hobbs.